In this collage I return to the oldest known Cinderella story, Rhodopis. It comes to us from the Greek geographer Strabo (64/63 BCE – c. 24 CE) who heard it in Egypt. Another account of Rhodopis has survived in Aelian’s (175 – c. 235) writings implying the Cinderella theme remained popular throughout antiquity. Interestingly, the story mentions Aesop of fable fame who lived 500 years earlier, indicating that the story probably originated much earlier than the 1st century CE. Aesop used stories featuring animals to teach lessons in morality; from her very beginning, Cinderella is doubly linked with the animal world. In this version Rhodopis is a slave girl who is teased unmercifully by the other servant girls for her fair complexion. After her master gives her a pair of rose-gilded slippers, they dislike her even more. At the next feast day they give her so many chores she cannot attend the celebration. As she washes clothes in the Nile, her slippers get wet and she puts them on the bank to dry. The god Horus swoops down in his falcon form, flies off with her sandal, and drops it in the Pharaoh’s lap. He goes in search of the owner and you know the rest of the story! I’m struck by how very old this story is and how long it retained the shoes and the bird as part of its bones. In my last post I mentioned the symbolism of ownership and possession inherent in the shoes. Years ago, I moved to Saudi Arabia where I lived for sixteen years. One of the first things I learned was not to ever point the soles of my shoes at someone. It is considered an insult. I always thought it was because shoes touched the dirt and were unclean. I see now that it might imply ownership. In a part of the world where slavery existed officially until very recently and still continues unofficially in some households, I understand how this might indeed be a grave offense. It also explains why shoes are left at the door of the mosques (and in other countries and faiths, the temples). The holy places belong to God and no human can possess them or claim ownership. In my collage there is only the god Horus, the sandal, the sky and the desert. I wanted to capture a tiny bit of the majesty and terror and beauty of this stark realm. 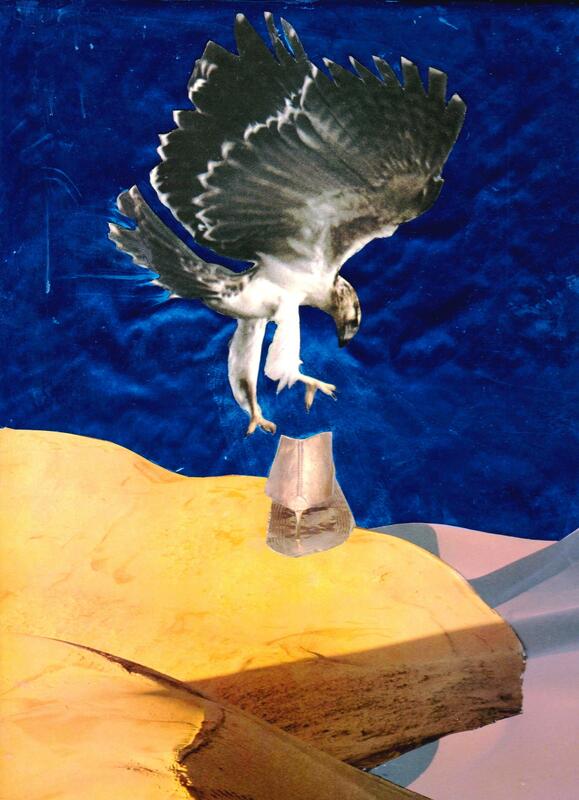 The collage represents a moment of suspension, of transition and transformation. In a moment the shoe will drop into Pharaoh’s lap and everyone’s life will change. The collage recalls a passage in my novel Magdalene A.D. in which Mary Magdalene, the protagonist, has been stung by scorpions. Lying in a fever, near death, she dreams three dreams. In the second dream she falls through the sky like the sandal in my collage. In the third, she dreams of flying over the desert in the shape of a sacred vulture. These images also recall my vision quest in the Mojave, during which I spent three days and nights in the desert in the company of a Joshua tree. I feel deeply satisfied with this image (though the blue of the sky didn’t scan very well because I used a metallic electric-blue paper that was really hard to work with). It seems a far cry from all the busyness of the story and its complex overlay of worldly socio-economic concerns, yet somehow Cinderella brought me to a place of immense solitude and hushed expectancy. Cinderella consistently retains its ties to the spirit world – whichever of the many versions one reads there is always some mystical connection made by an animal, plant or ancestor that connects the feminine to the divine. Perhaps this is the true meaning of the story. Buried in a midden of lust, ambition, greed and cruelty the heart of the world still beats for us, still offers connection.